Are you losing your spouse because of an affair? 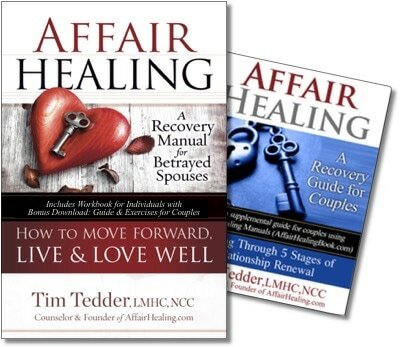 The following guide (expanded in chapters 3-4 of The Affair Healing Manual for Betrayed Spouses) is intended to help you determine the best course of action for encouraging your growth and your spouse's return. Few life experiences are more complicated and confusing than trying to navigate through a marriage when your spouse has veered off course. Despite past promises of lifelong partnership, you find yourself married to someone who seems to be changing their mind. Once you were a team; now they are heading in a new direction, alone or with someone else. So what do you do? Do you wait and hope they come back? Chase after them and try to turn them around? Or do you just let go? Your spouse has had an affair. Your spouse is either ambivalent or resistant to doing the work of restoring your marriage despite your willingness to do so. Whether or not the affair has ended (sometimes you don't know for sure), they make no consistent effort to reconcile with you. Your spouse will not commit to a future with you. They may tell you they don't love you anymore. Or maybe they say they love you but are no longer "in love" with you. Or maybe they just claim to be confused. You want to consider marriage recovery & renewal as an outcome. Many marriages do not survive infidelity. Those that do usually require a lot of work over a period of time. If you have been betrayed, you can choose to leave your spouse and rebuild your life without them. But if you decide to hold out hope for change, this article will help. If you choose to follow the strategy outlined below, DO NOT ask your spouse to read this. They need to get a clear sense that your choices originate from personal resolve rather than from some new strategy you’re trying out. Their awareness of these recommended steps may cause them to criticize "your plan" instead of responding to your intent. The Affair Healing manual is available for purchase in these formats: PDF Instant Download and Amazon Kindle. I've known many betrayed spouses who, out of tremendous strength, offer grace to an unfaithful partner. Despite their deep pain, they express a willingness to work toward forgiveness and trust. Sometimes, this is the first step toward a rebuilt marriage that is deeply satisfying to both. Sometimes... but not always. An unfaithful spouse may refuse this offer and send a clear message in return: I'm not really convinced I want this marriage anymore. Telling your spouse that nothing they do matters; that you will continue to love them no matter what. Assuming responsibility for the affair and promising to change. Constantly pleading with your spouse to stay. Insisting that your spouse continue in counseling even though they have no interest in it and put no effort into the process. Continuously blaming your spouse, trying to guilt them into doing what you want. When panic leads you to either appeasement or control, your attempts to manage your spouse are likely to backfire; they will push your spouse away from you, not toward you. He/she will have an even greater urge to escape from your "neediness" or control. Your spouse may pity you and wish things were different, but can rarely return to loving again under these circumstances. More likely than not, they will struggle against any sense of obligation to fix your marriage. We easily recognize this problem in dating situations. If one person tries to force another into a relationship by begging or insisting, we know the result will not be favorable. So why should we think this dynamic changes after marriage? It doesn't. The only reasonable outcome to expect in this scenario is one of growing disrespect, not affection. So what should you do if your wayward spouse remains distant and uncommitted? What actions are more likely to alter your spouse's retreat? Start by refusing to play the role of a desperate spouse any longer. Instead, take control of your part of the relationship. Your spouse is not in a healthy place. There is a real possibility that he/she may continue to make choices that hurt you. Even so, you have to accept the fact that you cannot control their behavior. Instead, you have to start focusing on what you can control: your own choices. Tell your spouse you want your marriage, but you cannot work on building a strong marriage until he/she is committed to do the same. If you've been trying to control them, admit it. Apologize for trying to do something that wasn't your job to do. Let your spouse know that from this point on you will no longer attempt to control them. They are free to make their own choices. Let them go. Be honestly committed to letting your spouse go. You have to understand that your spouse may actually take you up on the offer and will be out of your reach, at least for a while. If you give this "letting go speech" as a manipulative ploy to get them back quickly, they will see right through your insincerity. You must be willing to stop all of your investigative patterns at this point (no more checking up on where they are, checking emails, demanding accountability, etc.). You have to be willing to risk their bad choices for a period of time. Be ready to give this some time, even if your spouse immediately tells you they don't want you to do it. Some spouses resist this kind of change because they realize they're losing power in the relationship. They may become angry and accuse you of making things worse (see Q&A section below). Or they may immediately break down and promise to give you everything you've been asking for. Your caution should be on high alert. If you give in too quickly, you'll likely experience a moment of blissful hope followed by your spouse's swift return to the old pattern of non-commitment. If your spouse says they truly are committed to working on this, let them know that you need time to feel confident about their decision. Make sure they back up their commitment with a plan of action (counseling, etc.) and stick to it. How far do you let them go? If you know your spouse is in another relationship, you may need to ask for physical separation. I've watched many relationships caught in a "Pendulum Pattern" where a partner swings back and forth between spouse and lover. This can go on a very long time, but the pattern will lose its momentum if you remove yourself from the equation. The type of separation (moving out of the house or just moving out of the joint bed) depends on your situation, but some type of physical separation is recommended in an ongoing affair. If your spouse's indecision is rooted in emotional confusion without active affair behavior, then this separation may not require moving out of the bedroom. In this case it simply means that you are letting go of your expectations. You are taking the pressure off them and focusing on other things. How long should you let them go? That's up to you. You'll probably want to seek help from a counselor or trusted person as you try to figure out how long you will wait, but one thing I do encourage you to do: Have an end date in mind. You can always adjust your deadline, but you should have some sense of how much time you are willing to give your spouse. This choice is a very important one. Your spouse needs to experience your shift in the relationship. Up to this point, you've been easily available to them, but they do not value this and may have lost respect for you. So back off. Create some distance between you and your spouse, not out of anger or revenge or manipulation, but out of a need to focus more on yourself and less on your spouse. You need to limit your availability in these ways: give less tenderness, less talk, and less time. If your spouse is not in a physical affair, you may still have moments when affection is expressed, maybe even sexually, but you should not be the primary initiator. Your spouse should definitely get the sense that you don't need to be with them. Up to this point, you probably have been talking too much. Start limiting the amount of communication (talking, texting, emailing, phone calls, etc.) you have with your spouse. Keep away from emotional conversation. If your spouse invites you to talk about how you feel, give an honest answer, but keep it brief. Restrict conversations to business-of-life issues (schedules, paying bills, responsibilities, children, etc.) and avoid bringing up relationship concerns. The key is to focus on communication that allows you to remain confident, calm, and in control. You should be less available to your spouse. I don't mean you should selfishly refuse to do anything with him/her, but I do mean you need to make sure your calendar includes some activities/events that are just for you (or you with the rest of your family). You are capable of finding meaning and enjoyment in life apart from your spouse; they need to experience that. You've been focused on changing your spouse, now it's time to focus on changing YOU. Your contentment in life should not be bound to the whims of your spouse or the circumstances of your marriage. Of course, these both affect you deeply, but they should not control your contentment. Rather, your satisfaction in life should be firmly rooted in your contentedness with who you are and who you are becoming. Who do you want to be? What is your understanding of the design or purpose for your life? What does God want for you? What in you gets in the way of realizing those things? What are your passions? What do you enjoy that you haven't done in a long time? What have you always wanted to do? What new things get you excited or make you want to learn? Stop trying to get your spouse to a better place. I hope they eventually get there, but the only person you control is you, so start being intentional about doing those things that help you grow. Before you start this process of self management (instead of spouse management), think it through. Consider your choices and be determined to make them. Talk with a counselor or trusted friend who will support you. Now you have a choice. If you want, you can give the letter to your spouse, ask them to read it, and then invite them to ask any questions. But I recommend that you ask your spouse to listen without interrupting while you read the letter to them, answer any questions they have, and then give them a copy to read again later. 1. Conflict diminishes. You and your spouse will no longer be locked in a control struggle and so you will likely experience more calmness. This may not be the return to passion that you're longing for, but it will be a welcomed change for you both. 2. Confidence increases. As you take control of your part in this relationship, your desperation will subside and your confidence will build. You'll begin to feel less like a victim and more like a person who is capable of walking through the deep pains of life. 3. Considerations change. Before, when your spouse felt trapped, he/she likely struggled with the question, "Do I really want to stay in this marriage?" but now that you have stopped grasping and have started moving independently the question may become, "Do I really want to lose this marriage?" Instead of feeling pushed away, they may feel themselves being pulled back toward you. If the pain of losing you is stronger than the payback of separation from you, then their motivation will begin to shift, making room for the consideration of genuine change. This information in this article is further explained (with exercises & worksheets) in Chapters 3 & 4 of the book, Affair Healing: A Recovery Manual for Betrayed Spouses.